As of September 2017, Caffeine & Cocktails no longer opens for lunch Monday to Friday. I’ve not taken this review off the lists, but bear that in mind if you’re thinking of dropping in for a coffee and a toasted sandwich during the week. One thing I often complain about is big, bloated menus; huge things with a bewildering array of dishes leaving you to wonder how you can possibly avoid a dud. Indian restaurants and Chinese restaurants are especially prone to this, but actually it’s an issue in many restaurants. Like a CV, a menu should be short and to the point, it should advertise what you do well and it should never outstay its welcome. Just as nobody needs to hear about your Duke Of Edinburgh Award from umpteen years ago, I don’t think diners want a plethora of options knowing full well that the only way that kitchens can do them all is through the ping of the microwave or the sinister hum of the engine of the Brakes Brothers lorry. It’s no coincidence that the first thing Gordon Ramsay used to do in Ramsay’s Kitchen Nightmares was slash the size of the menu (well, that and criticise people’s omelettes). I mainly tell you this because, if it gets nothing else right, Caffeine & Cocktails succeeds admirably in this department. Six options for breakfast, three options for lunch, two for dinner. 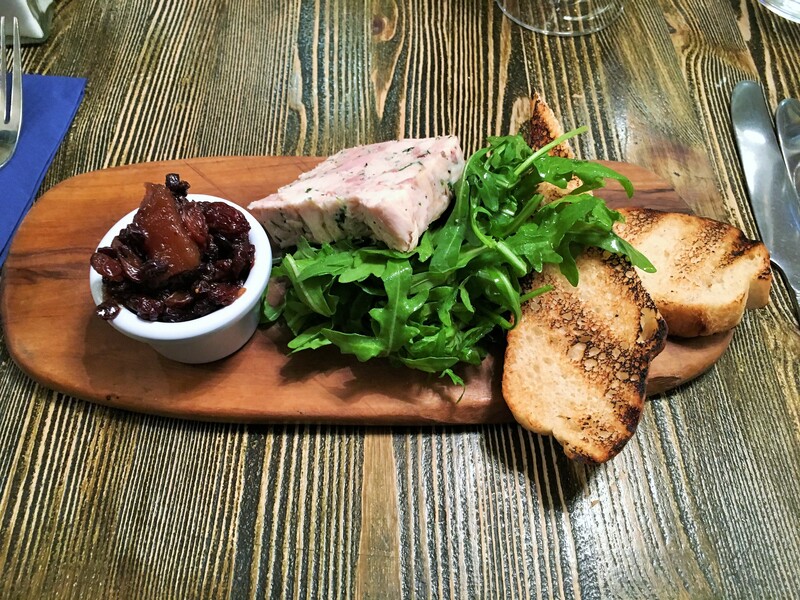 Breakfast until 11, lunch until 3, meat and cheese boards from 3 until 6. Over half of the choices are meat free. There’s an elegant simplicity to this that I wish other establishments would learn from (although paradoxically Dolce Vita, right above Caffeine & Cocktails, has a colossal menu and I’m still yet to have a bad meal there). I turned up right on the cusp of eleven am with a companion, ready to sample both the breakfast and lunch sections to give as full a picture as I could. Caffeine & Cocktails used to be Mix bar, a place I never much liked with horrible garden furniture (nobody should have to sip a cocktail sitting on a huge faux marble bench) and a ludicrous “private area” behind an unnecessary velvet rope. Every time I used to walk past after last orders I could see the clientele standing outside, clanging away on cigarettes, a relentless doof-doof-doof noise coming from the Stygian depths within and it made me long for my bed with a nice cup of tea, a hot water bottle and Just A Minute on the iPlayer. In short, it made me feel ancient. The transformation is sleek and striking. It’s a long thin room with attractive parquet-effect tables, clubbable Chesterfields, a dark concrete floor, indoor trees, gorgeous herringbone tiled walls and industrial light fittings. It really is quite lovely without trying too hard (unlike, say, RYND) and a surprisingly pleasant place to while away time. Only one thing lets it down, and that’s the dreary sexism of the graffiti in the toilets. Marriage is a workshop… where husband works and wife shops”, said one quote in the gents’. Why did the Mexican push his wife down the stairs? Tequila said another. It feels a bit like they invited Donald Trump to the loos with some chalk and told him to go crazy, and that crassness really lets the side down. The irony – they have the most beautiful Aesop handwash at the sink, but you still leave the bathroom feeling unclean. The ladies’ toilets, if less positively offensive, are equally lazily stereotypical with references to diets, cocktails and Taylor Swift. Anyway, let’s talk about the food. Caffeine & Cocktails only does three sandwiches and I went for “The Cheesy One”, a mixture of cheddar, Comté and Emmental with onion chutney and mustard, mainly because I’d been a couple of times shortly after opening, ordered that sandwich and always been impressed. Something about that mixture of cheeses, when toasted, really works – the gooey elasticity of the Emmental, the punch of the mature cheddar and the grit of the Comté is a holy trinity, perfected by the sweet chutney and the tangy mustard. 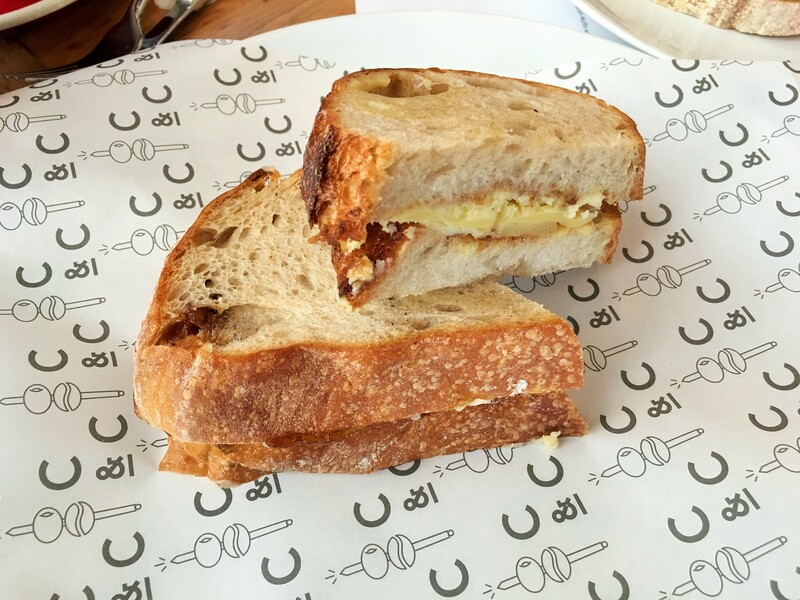 So I was saddened to find that when my sandwich turned up it completely failed to live up to my happy memories – it was barely hot at all, the cheeses were still cold at the centre of the sandwich, the flavours failing to come alive. It was definitely meant to be toasted, I could tell that by touching the bread, but clearly a half-arsed job had been done. It wasn’t that it had been cooked and left lying around, it had just never been cooked properly in the first place. And although there were quite a few tables occupied on a weekend morning, it’s not like they were rushed off their feet. Such a sad waste of potential: without the transformative power of the grill the sourdough, which should have been slightly charred, oiled outside and oozing within, was just a chewy, anticlimactic wedge. If I’d never had it before, I would have been disappointed. As it was, I spent the rest of my lunch wondering whether I was more or less disappointed because I knew how good it could be. The toasted sourdough also made an appearance in the other dish I ordered, from the breakfast menu. 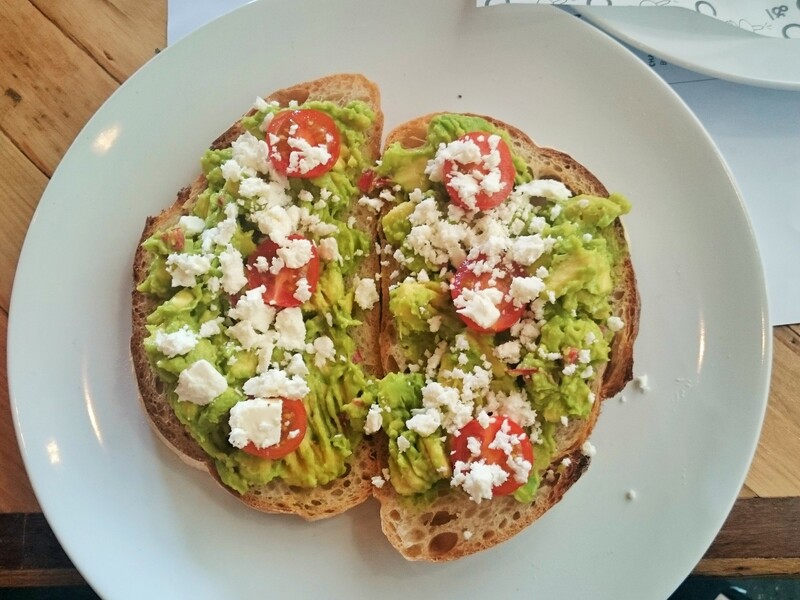 This time it was topped with “smashed” avocado (how very Shoreditch, 2014) with feta and tomatoes. Studded through the avocado were a few pieces of chopped red chilli but even with this the dish was lacking in oomph and needed something – a touch of lime, some salt, mint, or a lot more chilli – to elevate it from quick make at home breakfast to something with more flair. That’s maybe a little harsh – the topping was nice, not ungenerous and the cherry tomatoes added beautiful sweetness. But the bigger problem was the bread – toasted sourdough really wasn’t (unless it had been wearing factor 50 at the time) so what should have been light and crispy was instead soft, tough and somehow dried out. Another attempt to find a great breakfast in Reading ended unsuccessfully, I’m sorry to say. The drinks were a mixed bag. Loose tea is apparently from Good & Proper (Caffeine & Cocktails, Good & Proper… what is it with all these ampersands, I wonder?) and I’m sure it’s both those things but if you order Earl Grey you get a stump teapot full of hot water and a solitary bag of Twinings on the side. Basic verging on just not good enough, I’d say. Coffee is from Monmouth, and I’m reliably informed that the latte, while oddly thin and watery, tasted very nice. It was however, in keeping with all of the food, just not hot enough. The weird sugar, a mixture of white and brown cubes and lumps, also didn’t fill me with confidence. Lunch for two – a sandwich, a breakfast, a tea and two lattes – came to seventeen pounds. Service was nice and friendly, and maybe I should have given them the opportunity to prove how good it was by sending my food back, but I just couldn’t face it. I guess you’re more forgiving when it’s just a sandwich, or maybe the hassle just doesn’t feel worth it. I’m inclined to be forgiving with Caffeine & Cocktails. I didn’t have the best of visits, but I’ve been enough times to know that they had an off-day when I turned up on duty. And there are definitely positives: it’s independent; it’s stylish without sacrificing comfort; it has that clever, sensibly compact menu. On the other hand, if you only do a few things you have to do them well. There just aren’t any excuses. I really wish they’d been on song because that toasted sandwich, at four pounds, is far better than anything you could get at Pret or Picnic for the same money (especially if you dip the corner of it in a little pool of their very tasty, beetroot-purple, sugar-free ketchup). It clearly adds something to Reading’s food and drink culture, to the extent where I even found myself wondering whether its cocktails could finally replace the sadly departed Sahara. So despite the misfire I’ll be back to give them another chance. I’ll pass on using the bathroom, though. In nearly three years this is only the second time I’ve reviewed an establishment with a Michelin star. Part of that is because they’re all a little way outside Reading, and part of it is that I’ve never been entirely convinced they’re my cup of tea. I’ve eaten in a fair few, here and overseas, and they’re such a mixed bag that I’m not entirely sure what a star means any more. 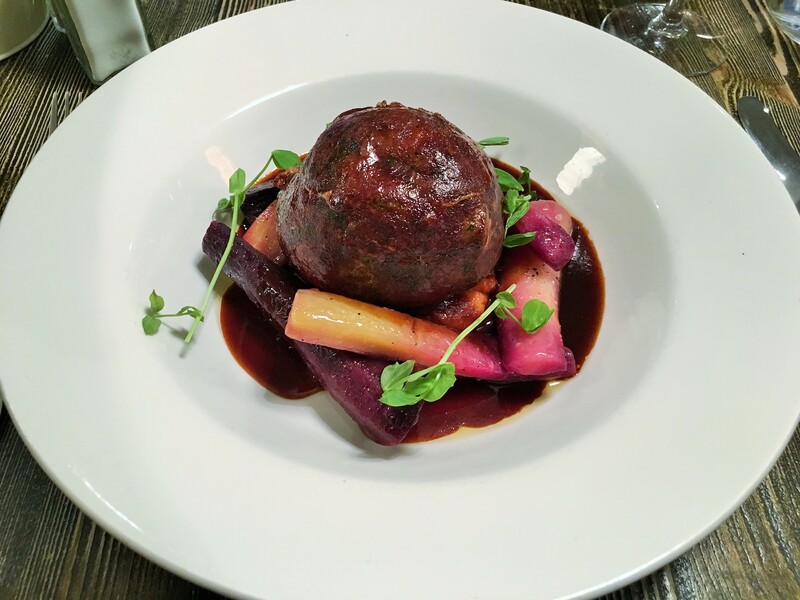 I’ve had beautiful meals in the Cotswolds and truly ordinary meals in London in starred establishments, and I’ve had wonderful evenings in many places bafflingly untroubled by Michelin. My opinion has also been coloured, I think, by l’Ortolan (which describes itself as “Reading’s Michelin starred restaurant”). It’s a classic example of what you used to have to do to get a star – a beautiful old building in the countryside with a mind-boggling wine list, efficient but soulless service and a fiddly, precise menu of dishes which look better than they taste and where, even if you order well, there’s always a sense that you’re left with a dent in your wallet which doesn’t quite correspond to the amount of fun you’ve had. My favourite Michelin starred restaurant was a place called Medlar at the unfashionable end of the Kings Road in Chelsea. Three courses during the week was a crazy twenty-five pounds, the service was lovely and friendly, the wine list didn’t feel like it was packed full of booby traps… and the food? Well, the food was plain delicious. When it lost its star (and I have no idea why it did) rather than making me think any less of it it reinforced my feeling that the Michelin inspectors and I were not fated to get along. But I’ve always been on the lookout for somewhere like Medlar closer to home, and that’s why I ended up making the half hour drive to Paley Street, not far from Maidenhead, to give the Royal Oak a try. One thing I liked about the Royal Oak from the start was that it still looked like a pub. Some pubs with aspirations aren’t really pubs, but there was still a bar and a front room and some cosy seats. I’m not sure how many people would go there just for a drink, but I appreciated the pretence – even if it was just pretence – that you could. I also liked the fact that we were seated in the pub proper, handsome high-backed chairs and a beamed ceiling, rather than in a sterile extension (I’ve been to the Hind’s Head and the Wellington Arms, similar establishments you could say, and had exactly that experience). 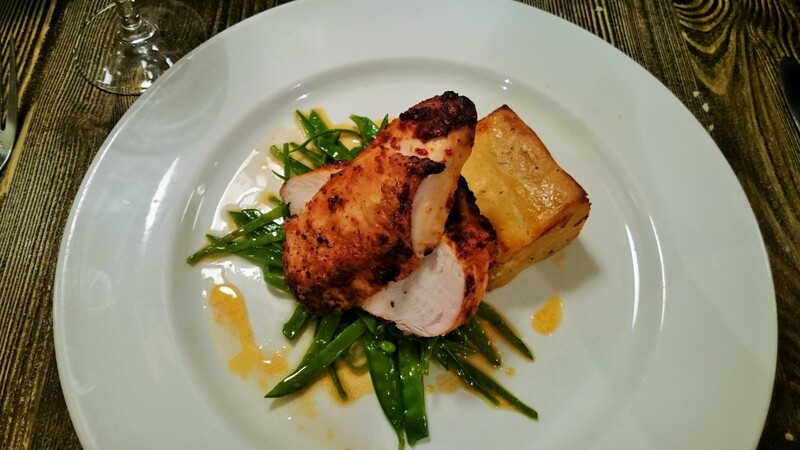 The menu was extensive, attractive and reasonable – two courses for twenty-five pounds or three courses for thirty. Slightly cheaper than, say, l’Ortolan, but more importantly the menu was full of good ideas and hard choices. It nodded more to being a pub than you might expect, so there were Scotch eggs and pies alongside the lobster and turbot. The wine list was attractive, too. I have no doubt that there were plenty of eye-watering options on there but there were also wines by the 125ml glass or by the 500ml carafe, lots of easy ways to drink with your meal without being stung. By contrast, when I went to l’Ortolan I actually ordered a bottle knowing I would leave some of it because it was still a better deal than wine by the glass. At half-one on a Saturday afternoon the place was pretty full, with a varied clientele (one chap, getting ready to leave, ordered a taxi to Sunningdale which gives you a good idea that there’s money sloshing round these parts). 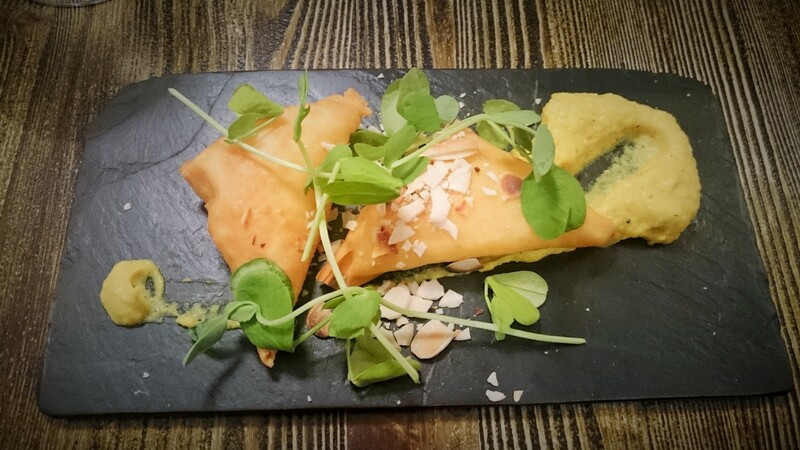 We started off with a couple of things from the pre-starters menu – again, I liked the more honest pricing that you pay for these if you want them rather than being given an amuse bouche and having the cost concealed elsewhere. 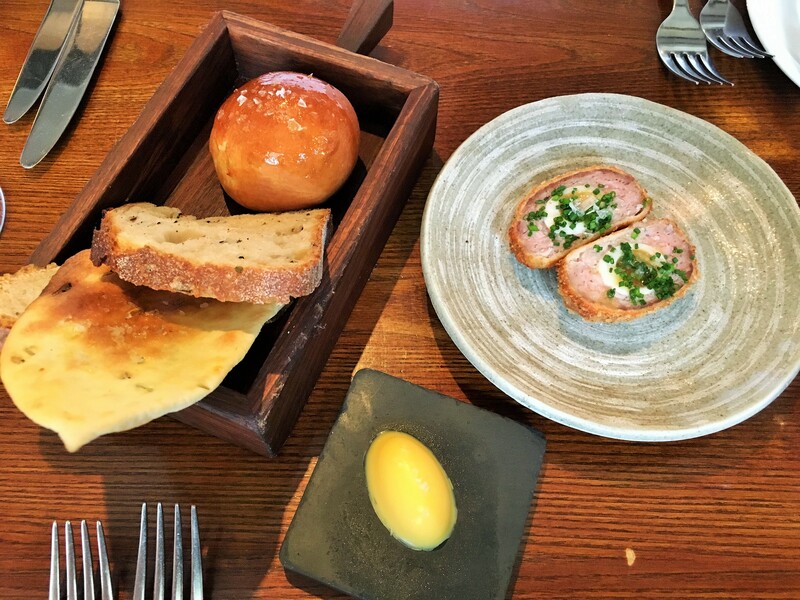 The selection of bread was gorgeous – the highlight was a glazed brioche packed full of cheese and a flatbread with fennel and salt crystals which was deceptively light and airy (the other two, with rosemary and onion and with caraway seed, were less impressive but still very good). One pound fifty for that little lot, which puts most Reading restaurants I can think of to shame. The Scotch egg was good but not incredible – firm coarse sausagemeat wrapped round a quail’s egg for three pounds fifty. I’m probably a Philistine to say so, but Dolce Vita’s is better. One thing these establishments always get right is timing. You’re never turned or rushed, and they have an almost intuitive grasp of when you would like your next course to turn up. When it did, it featured one of the highlights of the meal. Lobster raviolo was a stunning thing. Normally I’d potentially feel cheated by a solitary raviolo, but not here – packed all the way to the perimeter with beautiful lobster meat, the pasta just the right thickness, no padding. The small quenelle of chilli jam on top added just enough kick. 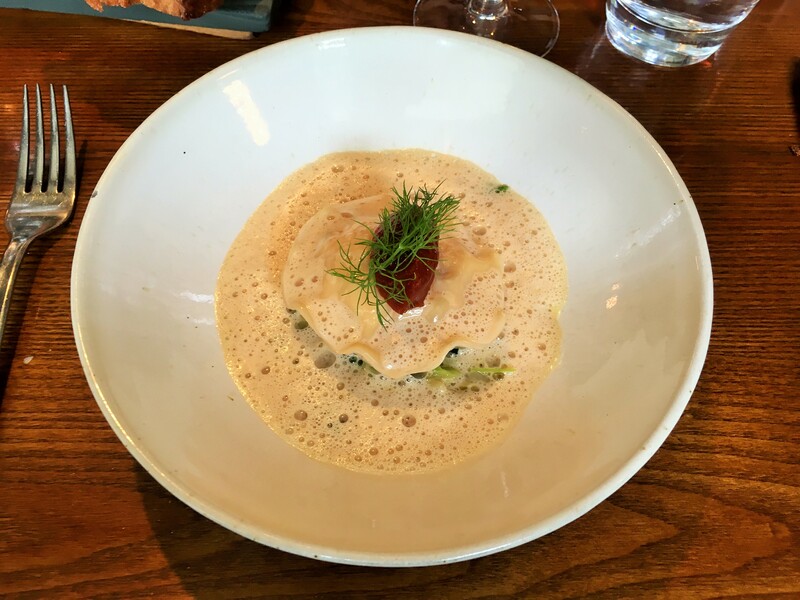 But underneath was arguably the real treasure of the dish – samphire and still slightly squeaky leeks (no fennel I could detect, despite what the menu said) in a bisque which was partway between a sauce and a somewhat knobby foam. It reminded me of that wonderful moment at the end of moules marinière when all that’s left is the sauce and a spoon and I always find myself wondering how much of it I can guzzle before I look very greedy indeed. No such problem here with this super-intense, super-concentrated sauce, so I got all of the ecstasy and none of the shame. There was a two pound supplement for this dish, which is so little that I almost didn’t bother mentioning it. I make no apologies for ordering something as prosaic as chicken liver parfait as the other starter. I love it, and whilst I know it’s the stuff of set menus everywhere I really enjoy its earthy dirtiness. And so it was with this version – the parfait itself was rich and slightly filthy, sprinkled with the ubiquitous sea salt crystals (at last! A restaurant fashion I actually approve of). It came with a decent amount of toasted brioche – so nice, for a change, to be given enough bread rather than facing those final few mouthfuls where the only way to finish it off is to pile it an inch thick. The pear chutney added a welcome hint of sweetness, although my companion did tell me if she hadn’t been driving she’d have ordered a Sauternes with it. Quite right too. Waiting long enough for the mains to turn up meant that I saw all the dishes I nearly ordered floating past my table, a little conveyor belt of potential regrets. 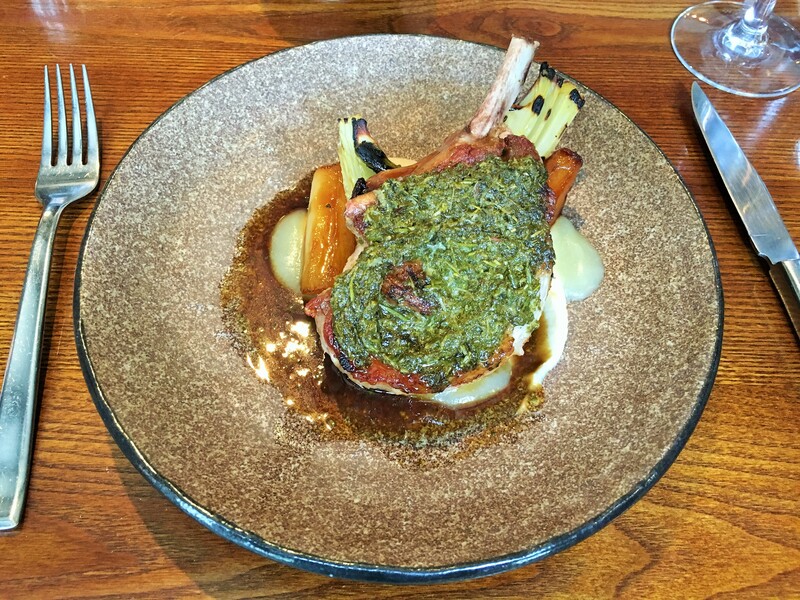 I had been sorely tempted to go for the rabbit and ham hock pie, but I instead chose the iberico pork chop. It was a beautiful-looking dish, but somehow it didn’t quite work for me. The pork was cooked through – too well for my liking, no pinkness at all – and completely encrusted in herbs, which felt like a needless distraction. It was a bit like it had been mugged by a jar of Schwartz. The soft caramelised apples underneath were lovely but the celeriac puree didn’t feel like it added much and the fennel looked scorched rather than braised, so the sweetness didn’t quite come out. It felt like it was crying out for greenery, and I was relieved to have ordered some chips with it (they, incidentally, were exemplary). A five pound supplement for this dish, which if anything just added to my wish that I’d gone for the pie instead. Turbot on the other hand was a delight. It was described on the menu as “roast turbot with peas and broad beans” and was almost (not quite) as simple as that description makes it sound. 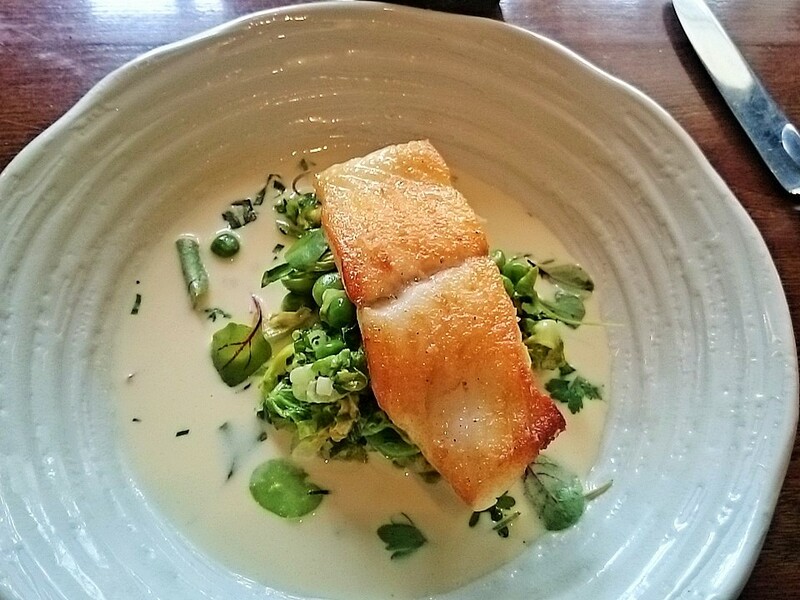 A firm piece of turbot, served on a beautiful mix of peas, broad beans, parsley, cabbage and cream. Nothing mucked around with or overdressed, just the right ingredients in the right ratio. It felt like a dish halfway between spring and summer – much like most of the last month, come to think of it. I was glad they brought a spoon so I could polish off the last of the delicious sauce, although it did make me wish I’d saved some bread (a lesson I have never learned, despite eating in restaurants for years). The dessert menu was the only place where I didn’t feel spoiled for choice. There was one standout dish, but because I wasn’t driving and had wandered more extensively round the wine list I gave way and found myself desperately looking for a Plan B. When it arrived it looked pretty and tasted pleasant, but it didn’t feel like it lived up to some of what had gone before. Crème fraiche mousse was light and clean, the strawberries were bright and sweet and the little discs of shortbread were pleasant. It was all pleasant, I suppose, but I wanted more than pleasant. I felt like I was eating a cheesecake that had been deconstructed to the point of inoffensiveness, and that wasn’t really what desserts should be about. 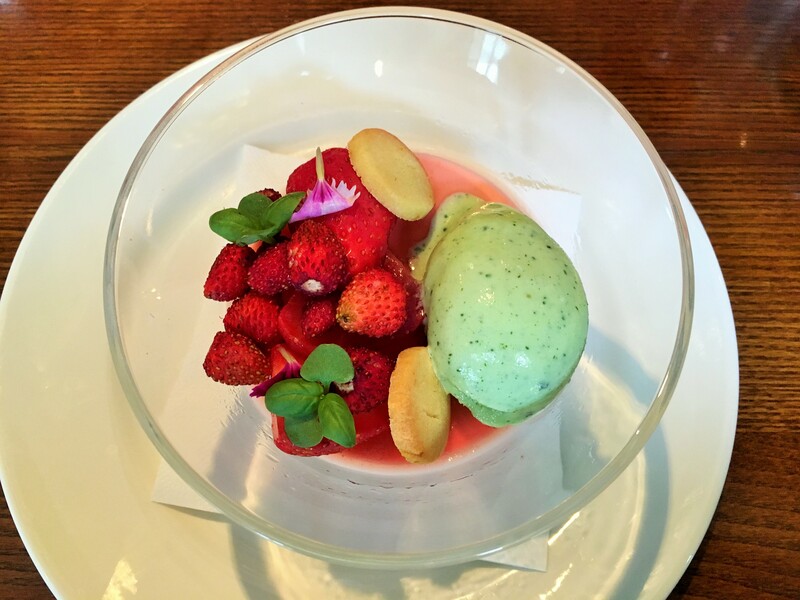 Only the mint sorbet on top – tasting every bit as green and fresh as it looked – held my interest. To make matters worse, while I ploughed through this I had to watch my companion eating the “Snicker”. 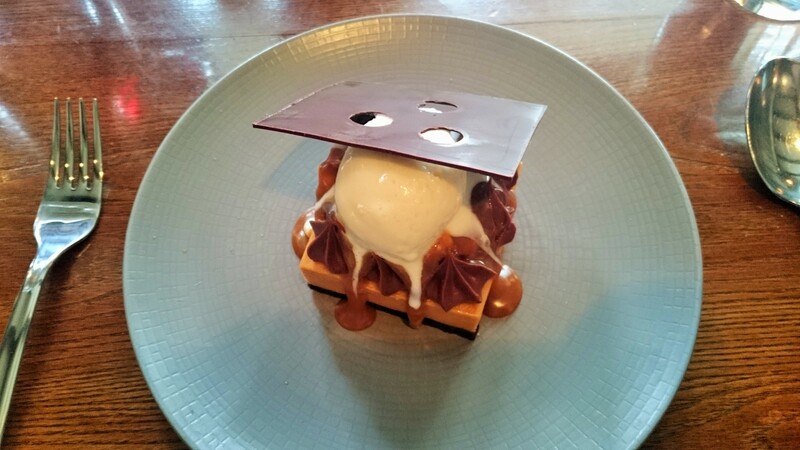 This was not your usual Snickers bar (just look at that photo! Oh my goodness). It wasn’t straightforward working out what each layer was but it seemed to be (concentrate!) toffee sponge, peanut mousse, piped chocolate mousse, toffee sauce, peanuts and peanut ice cream, all topped off with a slightly over the top slice of tempered dark chocolate. Listing all that rather misses the main point which was that it was utterly, utterly delicious. My guest ate it with a mixture of gusto and gloating, although she helpfully allowed me a couple of spoonfuls for quality control purposes (and, quite possibly, to stop me whining). That blend of sweet and salt will stay with me for a long time, possibly even after I can no longer remember anything else about the meal. What I struggled to understand was how a half-eaten one went back from one of the tables. What kind of monster would order that and not be able to finish it? We’ve come to the bit where I’d usually talk about the wine. Now, my knowledge of wine is pretty limited and the benefit of having a bottle is that you only have to inadequately describe one wine. Here, regrettably, I’m going to have to do that with – count them – four different wines. So, here goes: the Australian Riesling was just fruity and sweet enough to get me through the wait for my starter, and much less intimidating than its pale colour led me to fear it might be. The Chablis was crisp and clean and played a similar role, although my companion had to nurse it for longer. The New Zealand sauvignon blanc I had with my raviolo was punchier and more metallic, but still very tasty. Finally, the salice salentino I chose to go with the iberico chop was a splendid balance of fruit and smoke and did me very nicely indeed. The first two were around seven pounds for a 125ml glass, the second two closer to a fiver. Like I said, a good wine list to get lost in. Service was actually quite reminiscent of more obviously starred establishments, to the extent that it was almost incongruous. So everyone was pleasant and efficient but ever so slightly aloof. I didn’t mind that, but it still felt the wrong side of the fine dining divide for my liking. Lunch for two – snacks, a three course meal and four glasses of wine – came to one hundred and thirteen pounds, which includes one of those optional-but-only-if-you-are-prepared-to-make-a-scene 12.5% service charges. I often read reviews saying “yes, it’s Michelin starred but it’s possible to eat cheaply”. Don’t believe those people. It’s just not. Not without going and having a miserable time. Did I have a miserable time? No. I had a nice time. I had a nice time in a nice pub eating nice food, and maybe as so often with restaurants that do well in the guidebooks the problem is one of preconceptions. I’m reminded of Skye Gyngell, who won a Michelin star at Petersham Nurseries and wished she could give it back because it meant that punters started turning up with Expectations. If I had gone without expectations I might have really liked the Royal Oak. I managed to steer clear of having expectations with a capital E, but I still thought I’d be ever so slightly more impressed. Maybe this is just further evidence that me and Mr Michelin are never going to be bosom buddies. Still, no matter: a beautiful drive in the country, an attractive pub, a thoroughly decent meal at the end of it. If you go you’ll probably enjoy yourself. For myself, I’m just sitting here thinking about the road less travelled. The pie less ordered. So it goes. A disclaimer before we get started this week: I have form with Himalaya Momo House. I’d never eaten in the restaurant before, but I have friends who live in Caversham Park Village (or CPV, as I’ve come to refer to it) and when I visit them and they’re too frazzled to cook, Himalaya Momo House has become their takeaway of choice. Sometimes they have it delivered, usually we wander through the green spaces of almost-south-Oxfordshire-but-not-quite to pick it up. Every time we have, even though it’s in one of those vaguely purgatorial 60s rows of shops (like Woodley Town Precinct and no doubt countless others) the welcome has always been kind, friendly and warm and the people eating in there seem to be having a lovely time. The food, in my experience, has been thoroughly decent, too. 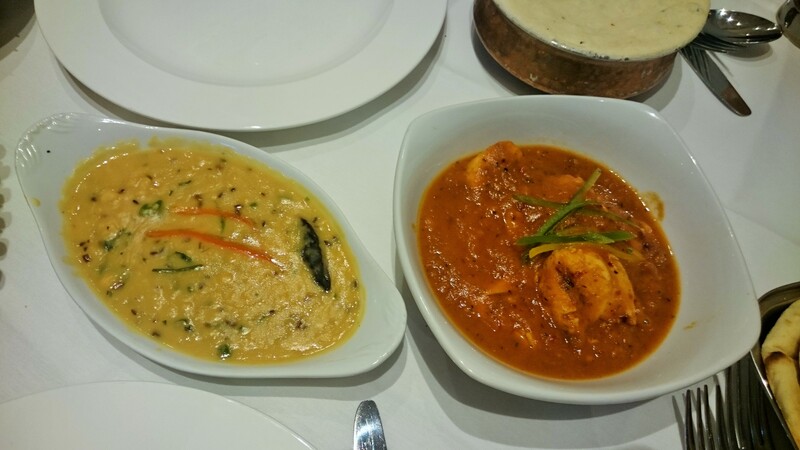 That ordinarily wouldn’t have been enough to prompt me to review it: after all, it’s a way out of town (albeit on the pleasant and surprisingly quick 23 bus) and Indian restaurants can be found everywhere in Reading. But I heard a number of people on Twitter enthusing about it, and I decided that it wouldn’t be fair to let my happy memories of it as a takeaway cloud its potential as a restaurant. So three of us, including my CPV resident friend Angela, paid it a visit on a weekday night to test it out properly (with a list of recommendations of dishes to order from Angela’s husband Frank, which I treated less as suggestions and more as a non-negotiable shopping list – he was at home with the kids after all, it seemed the least I could do). The room is basic and tasteful – plain squishy high-backed leather dining chairs, crisp white linen and attractive framed black and white photographs on the walls. There were even a couple of pleasant-looking tables outside in an optimistic attempt to introduce café culture to the area. Even on a weekday night a fair number of tables were occupied and there was a nice buzz to proceedings. Two of the starters had been suggested by Frank and were variations on a theme. 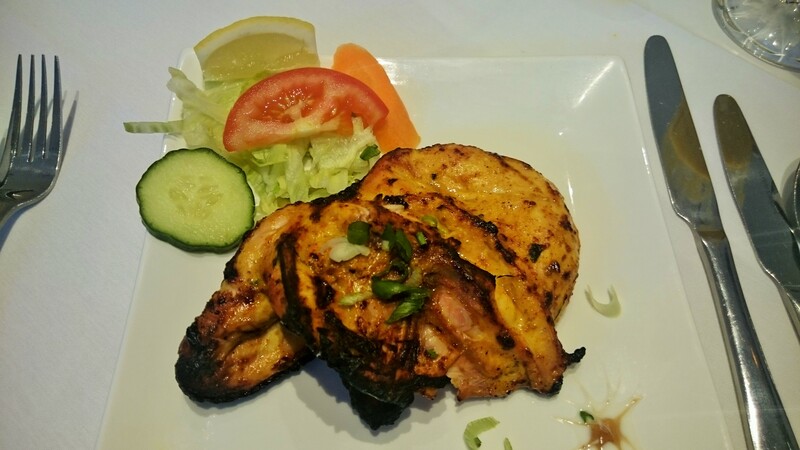 A quarter of Tandoori chicken came plain and unadorned – unless you count the salad (and who does?) and a weird splodge of two sauces that looked a bit like a manky spider’s web. I loved it – simple and unmucked with, although I would have liked some raita with it. It had just the right combination of crunch and tenderness, although it seemed like a small portion: only later did I realise that I was used to sharing an entire tandoori chicken with Frank (and if that sounds gluttonous, let’s just say I’ve seen him polish off an entire Nando’s chicken – extra hot – in one sitting, so I was very much along for the ride). Chicken sekuwa I liked less – cubes of chicken on a skewer dusted in, among other things, chilli flakes. The menu talks about a marinade but I didn’t get any of that, so no depth of flavour and no tenderness that would come from marinating the chicken. It was a little dry, a little tough and, compared to the tandoori chicken, a little surplus to requirements. That said, none of the starters were north of four pounds so nothing was exactly a costly blunder. 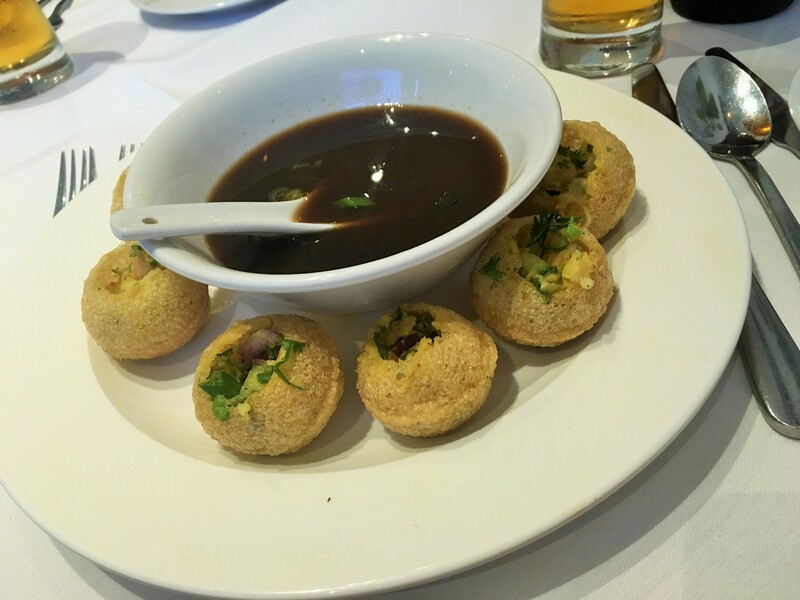 Angela is a vegetarian, so she went for the pani puri (described on the menu as “mostly liked by ladies”, a rather unfortunate piece of gender stereotyping if ever there was one). They were almost like bubbly crisps filled with red onion, cubes of potato and – I think – chickpeas, and eating them is both enormous fun and a race against time. You pick one up, fill it with tamarind sauce through the hole in the top and eat it in one go before the whole thing disintegrates, the gastronomic equivalent of disconnecting the wires to the bomb with the timer blinking 00:01 in red. I tried one and liked them an awful lot – far cleaner and tastier than at, for instance, Bhel Puri House, where if you’re not careful with the sauce you end up chugging a whole mango lassi with your mouth on fire. The mains took ever so slightly longer to turn up than I would have liked, but when they did they were an interesting bunch. We’d tried hard not to just order the bog standard kormas and jalfrezis so stayed on the house specials and Nepalese offerings instead. The most interesting was the dumpak lamb, which came in a copper pot, topped with a thin chewy layer of naan, speckled with nigella seeds. The meat steams under the bread, and the whole thing was pretty glorious – the lamb tender, the sauce rich and thick. What I had done, entirely by accident, was order something a little like a pie: you can argue that a dish with a lid isn’t really a pie, and I have some sympathy with that argument, but you can’t really argue that accidentally ordering a pie is ever anything less than splendid. 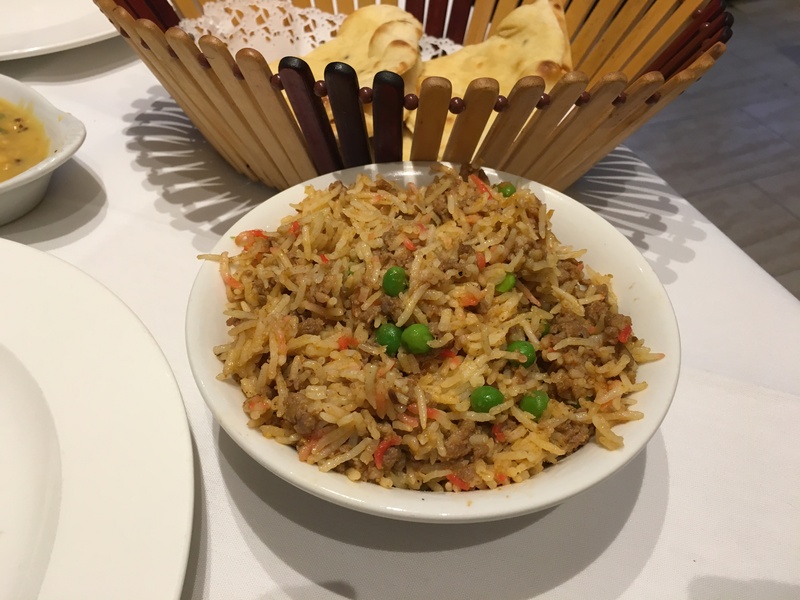 The sauce was beautiful mopped up with the plain naan or stirred in with the keema rice, a cracking dish of rice and minced lamb, again impressive value at four pounds. Sherpa chicken was more divisive. The menu mentions nutmeg, chilli and fresh mint, but I didn’t get any of that. If anything, the sauce was fruity and sweet with something I couldn’t place – pineapple or mango, maybe. I quite liked it, although it wasn’t on a par with the dumpak lamb. My companion who ordered it pronounced it pretty ordinary. The tarka daal on the side was lovely, though – sticky, salty, reduced to something thick and intense (although having eaten their daal lamb in the past, I expected nothing less). 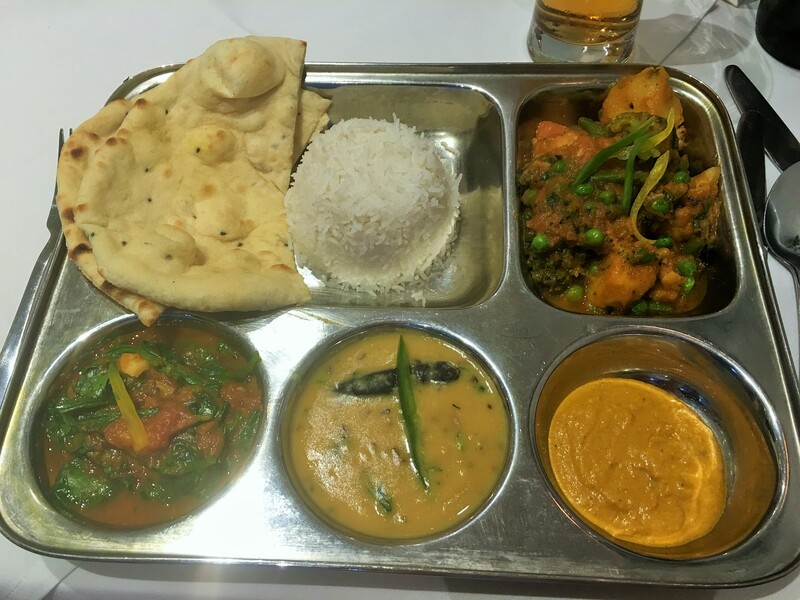 The vegetarian main was the thali, and again I managed to wangle a small taste of something from each of the compartments on the metal prison tray. It was almost enough to stop you missing meat: a vegetable curry with peas, firm chunks of potato, cauliflower, thin sliced green beans and a little heat. Another section contained a lovely spinach dish, not spicy at all but rich with tomato. There was more of that daal, to add a savoury note, a generous helping of naan and a dome of white rice shot through with cardamom. Last of all, a cold dish almost like a paste, again with plenty of tomato in it. I liked the whole lot, probably more than thalis I’ve had at other Nepalese restaurants in Reading (and having been to Dhaulagiri Kitchen, that’s quite a high bar these days). Angela loved it. The three of us were too full for dessert, so once the mains were cleared away and we’d begun the long, protracted process of digestion we got the bill and settled up. This is where it gets complex, because on weekdays Himalaya Momo House does a deal where you can get a starter, a main and rice or a naan for a tenner – impressive value indeed (although that didn’t apply to the vegetable thali, which seemed a bit mean). What that means is that although the bill for three – including two huge crisp bottles of Mongoose beer and a disappointing lukewarm mango lassi – came to fifty-two pounds it would ordinarily be a little more. All the more reason to pay it a visit on a weekday evening, I’d say. Service was lovely and friendly, if maybe stretched a little more thin than I was expecting – and all the serving staff were enthusiastic, kind and interested in feedback. 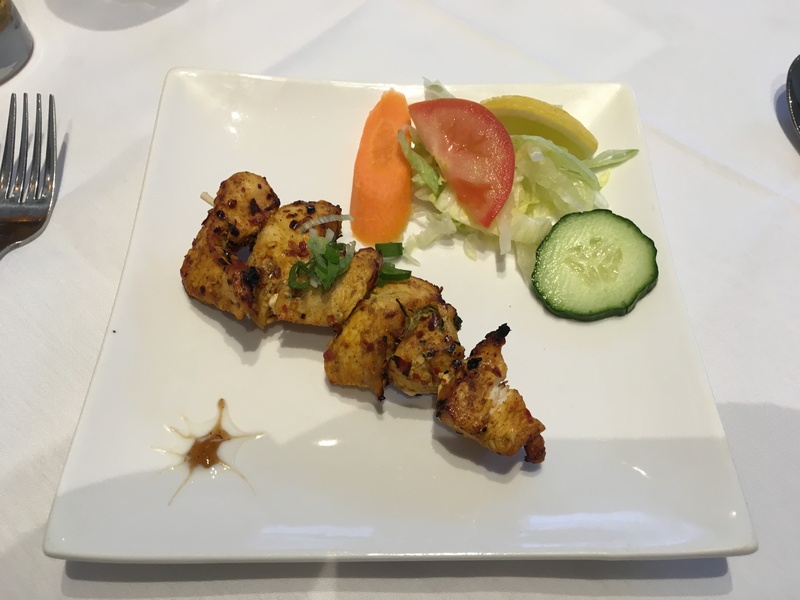 As a little postscript, I heard from Angela later that week – she had been back to Himalaya Momo House to pick up some takeaway (that tandoori chicken for Frank, no doubt) and the waiter had remembered her and everything she usually ordered. “When will you come back?” they asked her as she picked up her groaning carrier bag. That’s lovely attention to detail, and I think it’s that kind of place, the sort where you might want to cultivate the status of a regular. I think it’s obvious that I was charmed by Himalaya Momo House. The challenge is working out how much of that charm would translate to someone who doesn’t live near Caversham Park Village and would have to make a pilgrimage to eat there. Tricky. I loved the place, my other companion wasn’t so sure. “Just another suburban curry house”, she said. I don’t know about that. I think it’s worth a punt if you want to try something new, or go for a nice drive or take that 23 bus. You can report back and tell me I’m wrong. Would I have gone out of my way to eat there? I honestly don’t know, but it does make me glad I have friends who live in the area.